More than 3 million kids participate in martial arts, according to Simmons Market Research, and there are about 30,000 martial arts schools in the United States. Why the interest and popularity among kids? And, why is it growing so much in popularity at Roufusport Martial Arts Academy located on the Wauwatosa Milwaukee border? 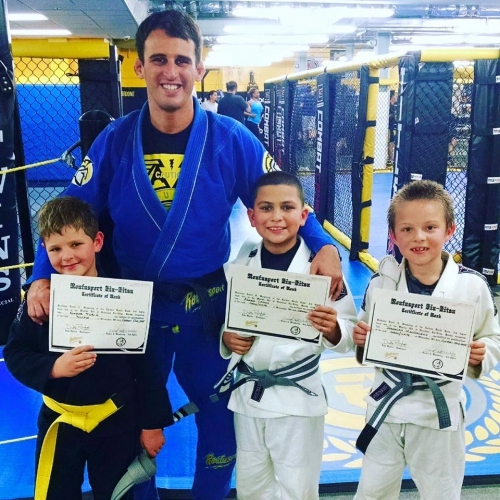 Sure, martial arts skills and techniques can help kids fend off the school bully, but at Roufusport we realize it’s about much, much more than just that. Martial arts builds character, teaches respect, hones discipline, combats couch potato syndrome and cultivates positive life-long skills. Due to the popularity of mixed martial arts, Roufusport offers a combination of Carlson Gracie Jiu-Jitsu and Roufusport Martial Arts four days a week. Martial arts builds character from the inside out. As kids bow as a sign of respect to their master and learn to share mat and instruction time with other students, they start to learn important character-building skills that can last a lifetime. Roufusport Kid’s Martial Arts promotes self-discipline, focus, consistency and respect. As kids see others grow in their belts and their abilities, they will also see the art of concentration and dedication in action, learning important skills and qualities that will serve them in the classroom, at home and in life. Martial arts combats the growing obesity epidemic. In the United States and elsewhere, more kids are struggling with weight and obesity than ever before. Between video games and processed food, less time for recess and more time on the couch, too many kids are building unhealthy habits (and metabolic diseases) at an early age. Roufusport’s youth martial arts program will help kids get in the best shape of their lives and stay there. Likewise, all of the skills and techniques that kids learn through martial arts will serve them in any other sport or athletic endeavor. Martial arts teaches kids self–control and how to breathe. These two things might not seem linked at first glance, but learning how to take a deep breath, calm down and react from a grounded place is a huge deal for kids (and adults…!). Kids then understand how to better control their emotions and impulses, to use their energy for good. Breathing techniques are very important in various martial arts disciplines and can benefit kids greatly outside of the dojo or school as well. Martial arts teaches the art of listening and socialization. Listening is crucial to both success and safety on the mat. Many parents of kids with ADHD report amazing progress when their kids learn to listen and focus during Roufusport’s martial arts classes. Martial arts also teaches teamwork, working toward a common goal and proper socialization with others. It brings kids together for a common cause and shows them what can happen when they listen, respond and connect. Certainly, Roufusport’s youth martial arts classes in Wauwatosa | Milwaukee teach important self-defense skills that can help even the smallest child defend him or herself from the schoolyard or neighborhood bully. But when it comes to character development, healthy habits, and self-control, self-discipline and self-respect, martial arts is that much more powerful. Martial arts can benefit kids immediately and for years and decades to come. To find out more, just take a minute to complete the short contact form on this page to your right. A helpful Roufusport staff member will contact you so your child (and/or yourself) can get started in Roufusport’s martial arts programs today with a FREE class! Questions? Please call (414) 453-5425.